Ingred: milk chocolate (sugar, cocoa butter, chocolate liquor, milk, soy lecithin (an emulsifier), artificial flavor (vanillin), peanuts, partially hydrogenated palm kernel oil, cocoa (may be precessed with alkali), whey powder, gum arabic, corn syrup, certified confectioners glaze. Allergen Statement: Contains peanuts, milk and soy. Ingred: milk & dark chocolate (sugar, cocoa butter, chocolate liquor, milk, soy lecithin (emulsifier), artificial flavor (vanillin), pecans, cashews, almonds, peanuts, gum arabic, corn syrup, sugar, certified confectioners glaze. Allergen Statement: Contains milk, soy, peanuts, almonds, cashews, pecans. Ingred: almonds, cashews, brazils, filberts, pecans, sea salt, peanut oil. 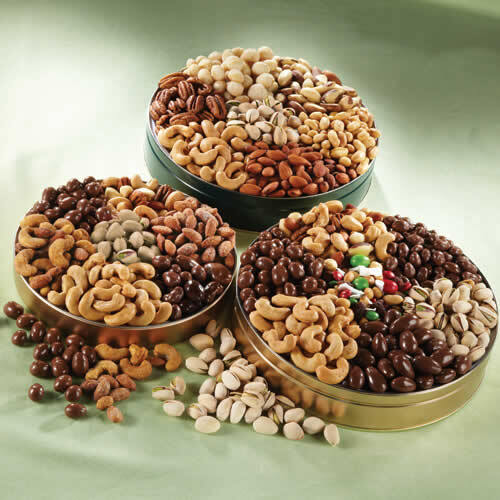 Ingred: cashews, almonds, peanuts, sugar, salt, furctose, honey solids (refinery syrup honey), honey, wheat starch, peanut oil, maltodextrine, corn syrup solids, xanthan gum, not more than 2% silcon dioxide and oilve oil added as a processing aid. 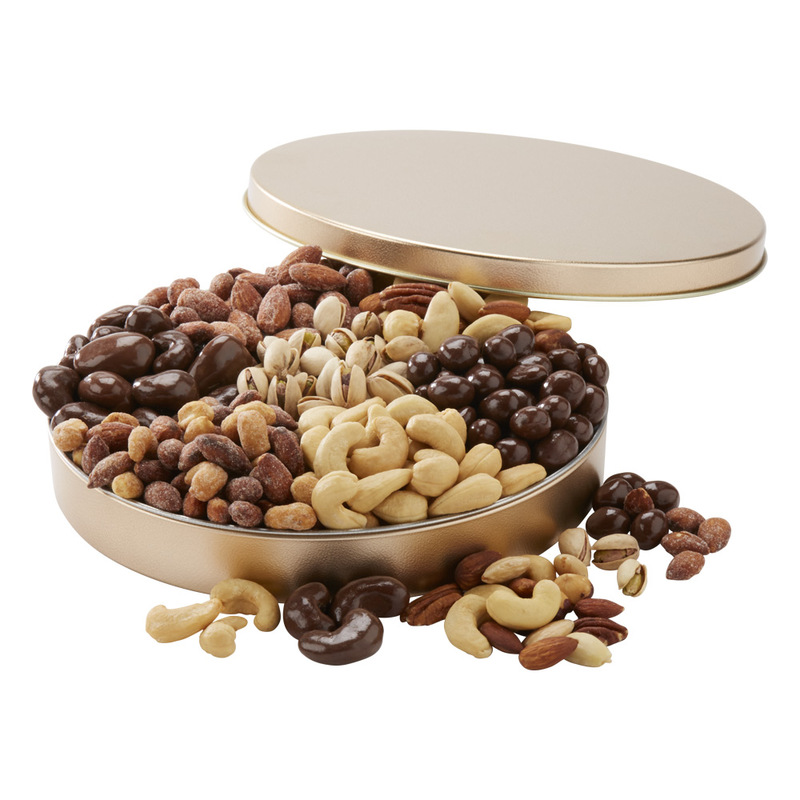 Allergen Statement: Contains cashews, almonds, peanuts, wheat. Ingred: almonds, seasoning (sugar, salt, fructose, honey solids (refinery syrup, honey), honey wheat starch, maltodextrine, corn syrup solids, xanthan gum, peanut oil. Ingred: pistachios, salt. U.S. cerified red 40 lake added.